Sule Skerry is a part of Orkney that few Orcadians have seen or set foot on. Some thirty miles west of the Orkney Mainland, it is a place of legend and tales of endurance; shipwreck and rescue, lighthouse and keepers, puffins and gannets and seals. The traditional ballads ‘The Grey Selkie of Sule Skerry’ and the ‘Tale of the Lady Odevire’ told of a child born to a woman of the land and a selkie (seal) man of the sea. ‘The Selkie of Sule Skerry’ achieved world-wide fame when sung by Joan Byas in the 1970s. The loss of fishermen hunting seals on Sule Skerry is remembered in the tale of Helen Waters, whose betrothed was drowned on a seal hunt at Sule Skerry, his corpse brought back to Stromness on his wedding day. 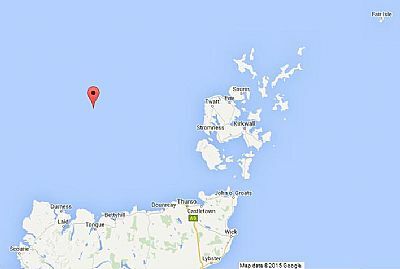 So many vessels were lost on Sule Skerry and the nearby Sule Stack that fishermen went there to salvage wreckage. The 88 foot lighthouse tower was built in 1893, with the most powerful lantern in the lighthouse service. Generations of lighthouse keepers manned Sule Skerry; in the early days their only contact by pigeon post based at Hoy Low Lighthouse in Graemsay. Principal keeper Angus Hutchison, born at the Sule Skerry Shore Station in Stromness, went on to be principal at Sule Skerry, and became Scotland’s last serving principal keeper at Fair Isle South, before automation. Keeper Calum MacAulay made ships-in-bottles to pass his off-duty hours at Sule Skerry, this remotest of stations. Due to a storm of easterly wind, NLB Pole Star was unable to relieve the keepers for the last time before automation, so the last relief was carried out by helicopter. Even with the powerful lighthouse lantern in operation, there have been several shipwrecks in the 20th century, the last being that of the Greek cargo vessel Manina on 4th April 1968, when seven of the twelve crew were lost. The thin soil of Sule Skerry is riddled with hundreds of puffin burrows, while Sule Stack is the breeding ground of 4000 pairs of gannets (Sulé being Old Norse for gannet). A chapter of the first Orkney Book (1909) is devoted to The Bird Life of Sule Skerry. The exhibition contained a remarkable collection of photographs on all aspects of life on Sule Skerry, along with lighthouse and light keepers’ memorabilia, and salvaged items from shipwrecks.